Dilemma: I'm heading to camp with a few young teenagers (all girls) and I'm assigned to present a craft one afternoon. I have a few ideas but none that are "tried and true". Solution: Email the talented Danyelle (who conveniently just attended "Girls Camp" as well) and ask for advice. She always has the best ideas! Honestly, this project is perfect for little girls too. I made several for my 6-year-old and she thinks they are pretty cool. I realize I need to enjoy this stage while I can! 1. Head to your local scrapbook store (the one with the die cut machines) with your purchased felt in hand. Allocate about a half hour to bang out a good number of felt flowers, butterflies, circles, etc. 2. 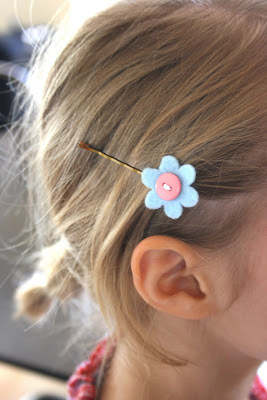 Thread the button onto the felt flower (or circle, or whatever) just barely and then continue threading with the bobby pin behind the embellishment, slowly attaching the pieces all together. 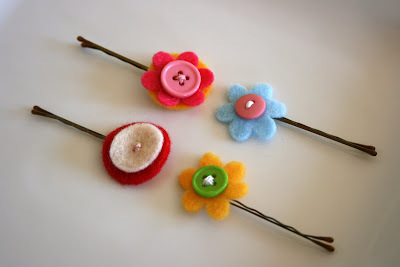 Use a color of thread that is complimentary to the color combination you choose for that barrette. 3. Trim with scissors and voila, you have a hand-made, good-enough-for-etsy creation in hand. All done by you! Many thanks again to Danyelle for the tutorial. While we are on the subject of Etsy, you must check out her fabulous etsy shop full of well-designed packaging, cards, business stationery, gifts, etc. She is one talented gal (and a mother of 4 kiddos to boot!). Those are absolutely adorable! I can't wait to try them! Love it! Too bad I didn't know that idea when you all were little! This project is adorable, by the way, and one I think I'm going to have to try out while the big boys are at school tomorrow, and the baby is napping. Good thing I have nieces!